Business is moving at an astounding rate. Two decades ago a printed catalog and a phone number would put you in business taking orders and shipping them out in a few days. Just a decade ago, putting up a web site with a little information and a "call now to order" tag line was good enough. Today, that world is gone. Customers expect a seamless experience across locations, devices, and time. 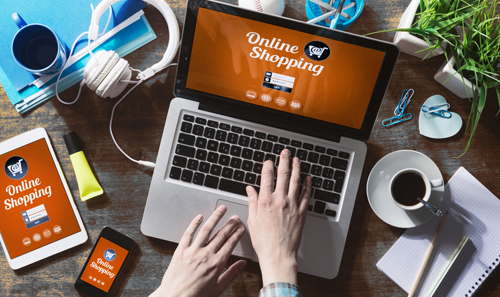 Customers are demanding the ability to order on-line, be able to call in and add to their order, and then walk in to your retail store and exchange the item for something else. Disconnected and disjointed systems make no sense to the customer and leave them unhappy and frustrated. On top of that, expectations on availability are through the roof. The concept of a back order makes no sense to customers and leaves them angry, wondering why they offered it in the first place. Customers' expectations are so high in this area that many marketplaces, such as Google Product Search or Amazon, won't show out of stock items or, at least, will penalize you heavily for back ordering a customer's order. Expectations on delivery are at an all time high as well. Shipping in two or three days is unacceptable. When an order is placed with two-day shipping the expectation is I'll get it in two days, not five. Customers are frustrated when an order is placed in the afternoon and not shipped the same day. Today you have to deliver to a customer what they want, when they want it. If you don't, someone else will. This requires a system that can efficiently manage products from demand, through purchasing, warehousing, shipping, and delivery while meeting your customer on-line, in person, or on the phone, no matter if they are at your website, in your store, or visiting a marketplace such as Amazon or Walmart on any device including PCs, Tablets, and phones. We call this OmniCommerce. The ability to meet everyone, everywhere, everytime. BirdDog Ecommerce creates a link between your website and your internal Exact Macola ERP system, creating an automated system for handling web orders and fulfilling them through Exact Macola Progression, Macola ES and Macola 10. Hundreds of Macola Users Have Gotten Suped Up! Dynamically connect pricing, payments, inventory, customers, orders and more from your back office ERP system and front end website with BirdDog Ecommerce solutions for Exact Macola Progression, Macola ES and Macola 10. BirdDog Ecommerce is your all-in-one tool that can manage and publish large inventory catalogs to a website, provide a full content management system for publishing content, easily brand websites, and track your performance with analytics all while streamlining your business process. Expand your business and grow online with BirdDog Ecommerce. BirdDog Ecommerce includes B2B, B2C and Sales force e-commerce environments which provide fully integrated web storefronts "built-on" Exact Macola. These web stores offer direct integration to Exact Macola Progression, Macola ES and Macola 10; streamlined checkout, reorder ability, order tracking, account payment and sales history. Web based order entry for call centers, sales reps, trade shows and route sales ! Cash Point of Sale is a seamless integration of counter sales, credit card processing, and your back office. This product give you real-time access to all your customer’s information and price codes. Cash Point of Sale accepts cash, credit card, and on account payments. This product allows you to view real-time quantity on hand by location, it handles returns, and gift card capabilities. 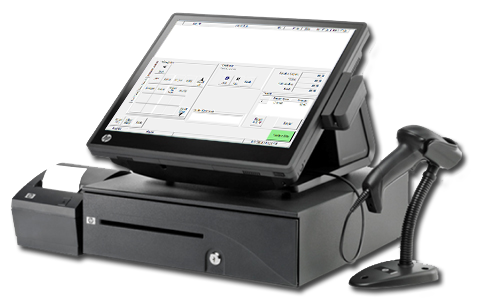 This robust Point of Sale system allows add Order headers and line comments, and register and end of day reporting. 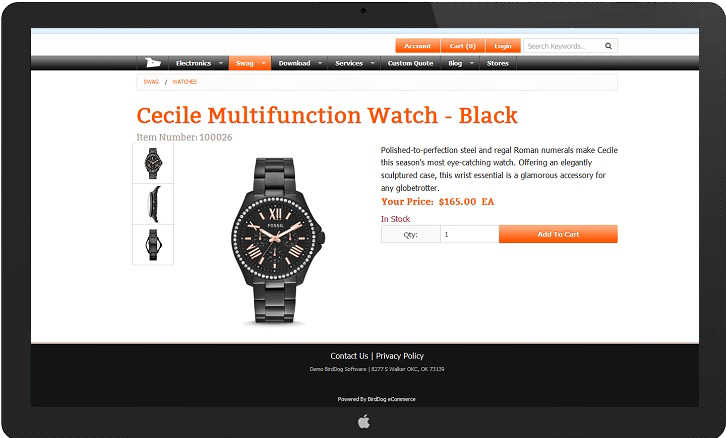 Enter credit card information and authorize orders in real time. Credit Card Deluxe integrated credit card solution runs seamlessly with orders placed through BirdDog Customer Service, Ecommerce, CASH Point of Sale and your back office Order Entry. Credit Card Deluxe takes the pain out of credit card management. From authorization to capture and payment application, let BirdDog Software automate your credit card process. Quickly authorize total Order amounts, including freight. Customer information is automatically pulled from the order. After orders have been selected for billing, the final order amount is automatically settled with your credit card processor- Even if different from the original authorization! 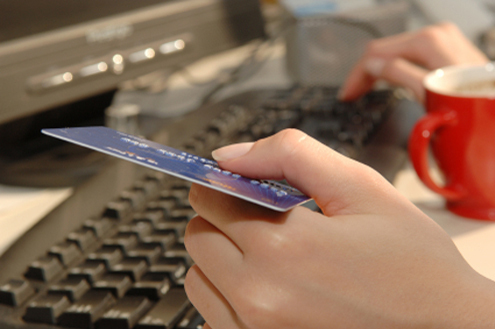 Settled invoice amounts are then written to Order and Customer invoices reflect the payment and card id information. enter credit card information and authorize orders in real time. 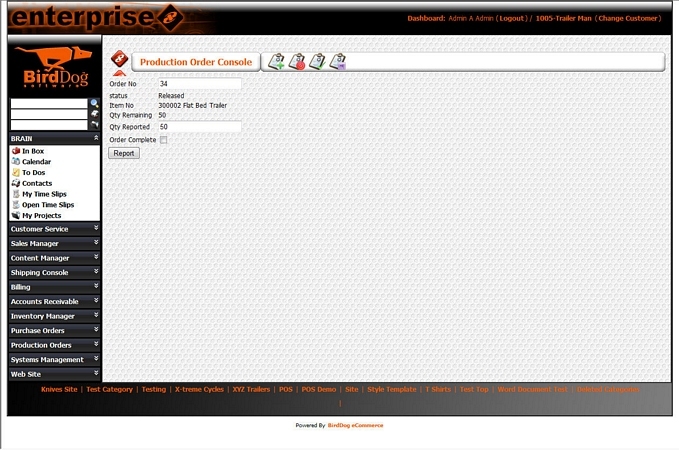 Web-based console allows you to create and release production orders with real-time reporting and analysis functions. Release Orders and report production in batch with customizable criteria. 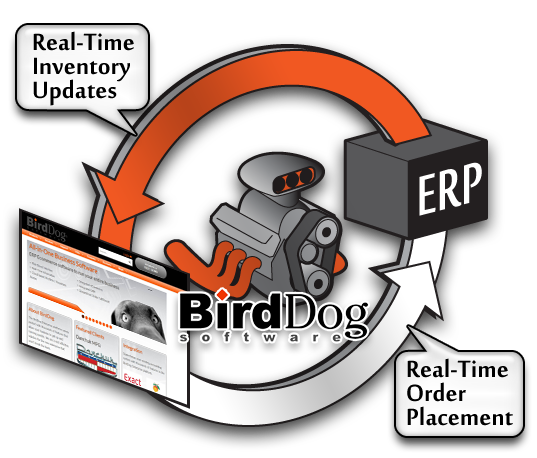 BirdDog Enterprise's Production Order Dashboard allows your personnell to quickly enter their productivity in the most efficient manner possible. Have multiple manufacturing locations? Setup user permissions to narrow views by facility. Are you tired of the monotonous, manual process of exporting and trading files back-and-forth with your bank? This suite offers BankRec to automate the reconciliation process. BankRec uses files provided by your bank to automatically reconcile your checks and provides a report of discrepancies. PositivePay provides data files for your bank to verify checks you have written. It makes important updates to general ledger and receives timely entries from the other applications. Not familiar with Positive Pay? Positive Pay requires the company to send (transmit) a file of issued checks to the bank each day checks are written. When those issued checks are presented for payment at the bank, they are compared electronically against the list of transmitted checks. The check-issue file sent to the bank contains the check number, account number, issue date, and dollar amount. Sometimes the payee name is included, but is not part of the matching service. When a check is presented that does not have a "match" in the file, it becomes an "exception item". The bank sends a fax or an image of the exception item to the client. The client reviews the image and instructs the bank to pay or return the check.